This year in particular, it seems like pop culture anniversaries are being celebrated with a manic passion. As such, it’s no surprise that Seinfeld’s 25th anniversary has seen nothing but feverish honor over the past few months; but a minor league hockey team is taking things to Kenny Rogers Roasters extremes. 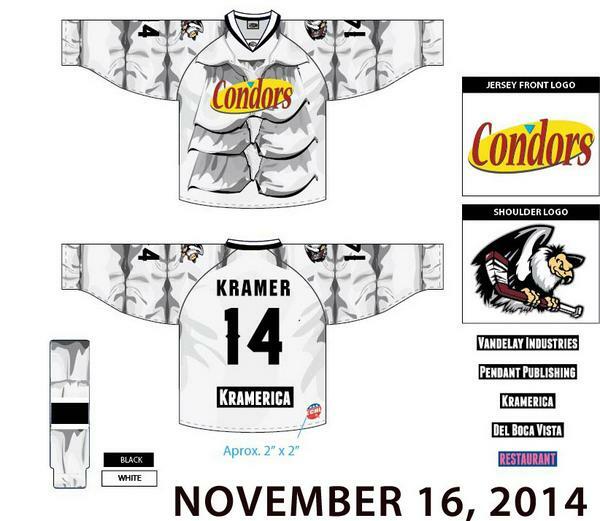 The ECHL's Bakersfield Condors have chosen November 16 as the day they show reverence to the classic sitcom by hosting an entire Seinfeld-themed night, where the team will wear special customized “puffy shirt” jerseys for the game. Never has anything hockey-related gotten my attention so quickly. Witness this amazing spectacle of sports clothing in all its pirate-like glory, complete with a redesigned team logo. The puffy puff and the logo would be solid enough, but the jersey will also feature the “sponsors” Vandelay Industries, Pendant Publishing, Kramerica, Del Boca Vista and “RESTAURANT.” Plus, the names on the back of the jerseys won’t be the players themselves, but beloved Seinfeld characters. You can see Bubble Boy, Assman, Kenny Bania, Puddy, Uncle Leo and 15 more confirmed names, obviously including the main foursome. If you head to the team's website, you can find out how to add your suggestion for the final five characters they’ll be putting on the jerseys. After the event, the jerseys will be auctioned off for the M.A.R.E. Riding Center in Bakersfield. Beyond the team apparel, the event will also host Ozmo Kramer, “the world’s greatest Kramer impersonator,” who will be signing autographs and dropping the puck. (I have so many questions about this.) They’ll be giving away festivus poles and coffee table books, and a Dance Cam will capture an Elaine-style Dance Off, for history’s sake. The first intermission will include a rickshaw race on the ice. If you bring a can of soup or a box of cereal, you get a two-for-one ticket, and they encourage everyone to dress up as their favorite character. Best-dressed costume wins a marble rye, so maybe you’ll want to dress up as an old bag who shuts up. Relive Jerry’s reaction to the power of the puffy shirt below. I’m so tempted to cancel whatever I’m doing that week and fly out there, but what is the deal with airplane food?